Editor’s note: “Cheese of the Month” is Cheese Market News’ exclusive profile series exploring various cheese types. Each month, CMN highlights a different cheese in this feature, giving our readers a comprehensive look at production, marketing, sales and in-depth aspects of each profiled cheese type. Please read on to learn about this month’s featured cheese: Swiss. SWISS PIONEER — Edwin Gossner Sr. (above), who brought Swiss production to the Western part of the United States, made Swiss wheels in traditional open copper vats in the 1940s. 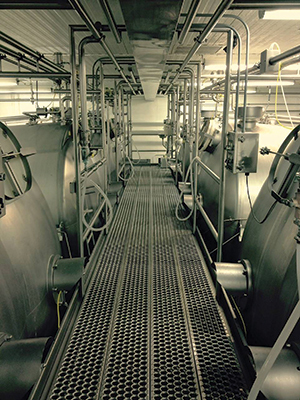 Today, Gossner Foods uses modern closed vats (below), that produce Swiss under more consistent temperatures. MADISON, Wis. — Swiss cheese, which has been an American mainstay over the last century, was introduced by a wave of immigrants from Switzerland who brought their native cheesemaking traditions to various regions in the United States. The holey classic traces its roots to the Emmentaler cheeses of Switzerland that were made in 200-pound wheels starting in the Middle Ages, when the Swiss government taxed cheesemakers on the number of pieces they produced rather than the total weight, according to the Wisconsin Milk Marketing Board (WMMB). The tradition of making these large wheels continued over hundreds of years since it produced an excellent-quality cheese with perfectly-formed eyes. Modern production methods and plastic packaging developed in the mid-1900s allowed for Swiss to be made in rindless blocks, providing higher yields and ease of cutting in foodservice applications. Ohio and Wisconsin were among the early states to help establish Swiss as a popular cheese in this country. Richard’s father, Alfred Guggisberg, began making cheese in Switzerland at age 16, and after coming to the United States in 1947 he teamed up with Amish dairy farmers in Ohio’s Doughty Valley to use their milk to make cheese, eventually opening Guggisberg Cheese in 1950. In the 1960s, Alfred developed the “Baby Swiss” style with smaller eyes and a more mild, creamy flavor. Wisconsin’s Green County was home to the state’s first Swiss cheese factory, which opened in Washington Township in 1869, according to the National Historic Cheesemaking Center in Monroe, Wisconsin. The cheese business experienced great expansion through the next several decades, and by 1925, this area of Wisconsin produced 84 percent of the nation’s Swiss cheese. Edwin Gossner Sr., who founded Gossner Foods of Logan, Utah, in 1966, brought Swiss cheese to the Western United States. Born in Switzerland, he immigrated to the United States in 1930 and learned how to make Swiss cheese while serving as an apprentice for his brother’s cheese factory in Wisconsin. 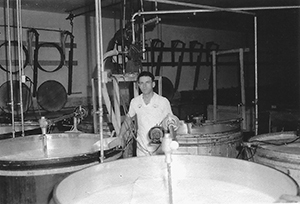 He later moved to California and made Swiss cheese for the Rumiano family, and in the 1940s he moved to Cache Valley in northern Utah, where he established what at the time was the largest Swiss factory in the world, producing 120 wheels of cheese a day. Swiss cheese is a full-flavored, buttery, nutty cheese with characteristic holes or “eyes” that is aged at least 60 days, according to WMMB. Baby Swiss, produced from whole milk, has a creamier texture and a more buttery, slightly sweet flavor and smaller eyes. In 2015, Swiss cheese sales in U.S. multi-outlet and convenience stores reached 94.9 million pounds, growing 2.5 percent from the previous year according to IRI data courtesy of Dairy Management Inc. (DMI). Traditional Swiss accounted for 87 percent of 2015 sales, while Baby Swiss held a 13-percent share. Baby Swiss has a 4.1-percent compound annual growth rate over the last five years, while traditional Swiss has a negative 2.1-percent compound annual growth rate over this period. DMI also notes that the demographics that skew highly for Swiss include older consumers — both males and females over age 55, according to IRI data. By format, sliced Swiss is by far the largest with 75.3 percent of the current volume share, IRI data shows. Sliced Swiss also is experiencing volume growth, up 2.3 percent compared to the year-ago period. Sliced Baby Swiss is growing even faster, up 6.3 percent from a year ago. Wheeler adds that a need for smaller eyes came with the growing demand for sliced Swiss. Wheeler says the biggest changes in Gossner’s Swiss-making process came with the transition from open to closed vats and the addition of a special press system that helped provide more consistent temperatures and uniform cheese sizes. The company also has made investments in creating a more controlled aging process. Despite all the new technologies, she stresses that one of the most important aspects of making great Swiss is having dedicated people in the company who really understand the cheesemaking process. With tastes changing toward more artisan styles and robust flavors, Swiss cheesemakers also have started to look back to traditional styles and methods. When Workman left his position as plant manager at Roth Käse (now Emmi Roth USA) to start his own Edelweiss Creamery, his goal was to bring back the traditional wheels of copper-kettle Swiss that used to be so prevalent in Wisconsin. Edelweiss Creamery, which opened in 2004, now makes 180-pound Emmentaler Swiss wheels as well as a number of other cheese varieties. Workman says the traditional copper kettle and naturally-cured rind give his Emmentaler a unique profile compared to more commodity-type Swiss. While it is not a regular wholesale offering, Guggisberg Cheese also produces a traditional wheel-shaped Swiss from time to time. Last spring, one of its 200-pound Swiss wheels was named the 2015 U.S. Championship Cheese at the biennial contest in Milwaukee. “It was a real thrill,” Guggisberg says. Guggisberg Cheese currently is in the midst of an expansion and modernization that will triple its current Swiss capacity. Once finished, Guggisberg says the plant will have the largest capacity of any Swiss plant in the United States. It also will include new equipment that will allow the company to develop other new varieties of Swiss. Swiss is one of the more challenging cheeses to make, Guggisberg says, and it also is one of the most interesting to eat.